Remote Service is the most convenient way to get service and support right when you need it. We can connect to your computer through the internet to troubleshoot problems, do software updates and installations, and for training. You save trip and travel charges and get the work done now. We can easily connect to both your Mac or your Windows PC. We use a remote program called TeamViewer to do it. In order for us to connect to your computer, you first must download the small TeamViewer QuickSupport program and open it. We can only connect when the program isn’t running. To download TeamViewer for Macs, click the blue button below that says TeamViewer for Macintosh. To download TeamViewer for Windows, click the gray button below that says TeamViewer for Windows. 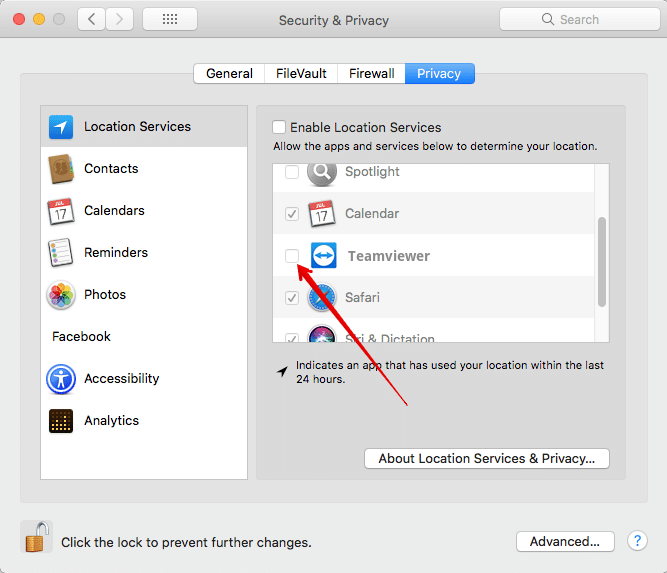 In the System Preferences window, click on the Security & Privacy icon to open that preference pane. In the Security & Privacy window, click on the Privacy tab. In the Privacy window, click the small lock icon at the lower left corner of the window to unlock it. You’ll have to enter the password you use to log into your computer or install software. If you need help, give us a call at 919-404-0222!